Here's the vertical planter we've been working on to brighten up our small garden. Whilst last year's gardening was all about changing the design and planting from scratch this year we've tried to be more creative. Our garden style is part Zen part reclaimed chic. This pallet planter definitely fits into the second category. Inspired by what we've seen online and out and about we set about creating our own easy version. Tools: Staple gun, small saw, scissors or knife. 1. Improve the appearance of your pallet if needed. Ours came from my in-laws and didn't need sanding but needed darkening with one coat of fence paint. 2. Lay the pallet on its front. Slide the unopened compost bags into each half of the pallet. 3. Secure in place using geotextile membrane and a staple gun. 4. Turn the pallet over. 5. With the pallet horizontal make rectangular cuts in the gaps between the planks with a knife or scissors. 6. Add plants to the gaps but allow room for growth. Work from the top down and leave the bottom row empty to allow for trailing space (we left too much space at the top in hindsight so ignore the photo). 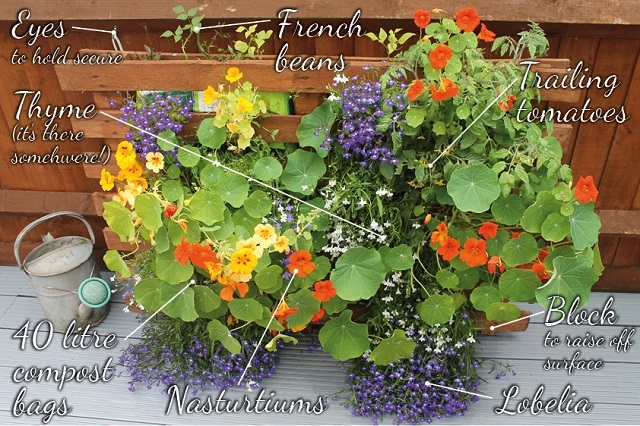 We chose nasturtiums, lobelia, trailing tomatoes, French beans and thyme. 7. Leave the planter horizontal for 1-2 weeks and water daily. 8. Gradually make the planter vertical over a week to 10 days. We used our garden table to prop it up at different angles. Move it carefully to ensure the compost bags don't slip out. 9. Secure the pallet to the fence with screw in metal eye hooks and electrical ties (you could also use chain wire or rope). 10. Stand the pallet on small blocks made from wood offcuts so that the surface underneath has chance to dry out after watering. 11. Once the pallet is vertical cut open the top of the compost bags and add more plants. 12. Water daily if possible even if it rains! 13. Finally enjoy your colourful and bee friendly planter. We love our vertical planter. Budget and bee friendly it gives a Mondrian splash of colour to our tiny garden and is inspiring us to experiment further with vertical planting. Using compost bags certainly saves time and mess. I hope you like our vertical planter as much as we do! Thanks Heather. Yes, disguising our bins is another project! Your garden looks great. I have a lovely cottage style garden but at times I long for something simpler with clean lines which would be easier to maintain. Yours fits this perfectly! Enjoy! Thanks Teresa. I'd definitely recommend trying to simplify your garden. 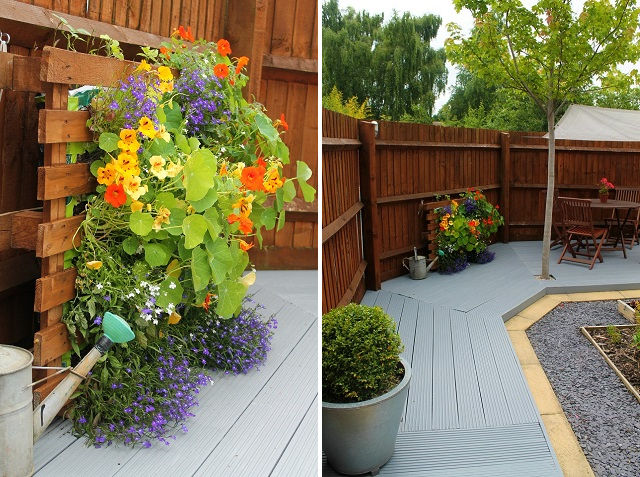 Your planter is lovely, what a great way to brighton up an expanse of fence too if, like us, the soil is not up to the job - grow bags are a very affordable filler too. Will try this next year! Thank you. The planter also hides some bent fence where the previous owner had placed a chiminea! What a lovely idea! I'm in the process of reclaiming my garden, the previous owners replaced beds and lawn with grey stones and I'm looking forward to making it an easy to maintain and much greener outdoor living room. I'll definitely try a pallet planter. I like the idea of an outdoor living room! Thank you Linda. Hope to see lots more pallet planters next year! The results are beautiful. Thanks for sharing how to make one. My pleasure and thanks for your encouragement!